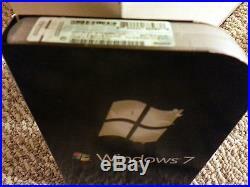 This is an open, but unused package of Microsoft Windows 7 Ultimate with both 32-bit and 64-bit versions. It is the full retail version-- NOT Academic, OEM, Not For Resale, Trial, Promotional, or Upgrade. The Microsoft SKU is GLC-00182. This package is licensed for activation on 1 system. The Windows 7 Ultimate from Microsoft gives you everything Home Premium and Professional offers plus added security features and the flexibility to work in multiple languages. Create a home network and share all of your favorite photos, videos and music. You can even watch TV programs for free, whenever and wherever you want. Windows 7 Ultimate is the most versatile and powerful edition of Windows 7. It combines remarkable ease-of-use with the entertainment features of Home Premium and the business capabilities of Professional, including the ability to run many Windows XP productivity programs in Windows XP Mode. For added security, you can encrypt your data with BitLocker and BitLocker To Go. And for extra flexibility, you can work in any of 35 languages. Get it all with Windows 7 Ultimate. This is 100% genuine and authentic Microsoft software, not a counterfeit copy. This will pass Microsoft's Genuine Advantage authentication, and you will receive full support and updates. Some of the Product Features are. (Includes 32 & 64-bit versions) Combines remarkable ease-of-use with the entertainment features of Home Premium and the business capabilities of Professional--get it all with with Windows 7 Ultimate. Make the things you do every day easier with improved desktop navigation; start programs faster and more easily, and quickly find the documents you use most often. Run many Windows XP productivity programs in Windows XP Mode; watch, pause, rewind, and record TV on your PC. Easily create a home network and connect your PCs to a printer with HomeGroup; connect to company networks easily and more securely with Domain Join. Recover your data easily with automatic backup to your home and business network; help protect data on your PC and portable storage devices against loss or theft with BitLocker. Work anywhere with less effort. Get connected in three clicks wherever there's a wireless network connection. Keep documents on your PC and on network servers in sync automatically. Your PC will automatically use the printer you prefer for whatever network you're on. Simplify making presentations special settings that keep your PC from sleeping and turn off messages, notifications, and screen savers. Get around your PC faster with the improved taskbar. Get to the files, photos, and music on any PC with Windows 7 in the house from any other. Print to any printer in the house from any PC with Windows 7 in the house. Advanced Backup and Restore makes it easier to keep your work safely backed up to external or network drives and accessible if you need it. File encryption helps keep proprietary and confidential information on a PC secure if it is lost or stolen. Preserve your investment in programs designed for Windows XP with Windows XP Mode. Easily add your PC to a secured, managed, network with domain join capabilities. Group policy controls help administrators more easily and effectively manage the security and configuration of multiple PCs. If you want to run Windows 7 on your PC, here's what it takes. 1 gigahertz (GHz) or faster 32-bit (x86) or 64-bit (x64) processor. 1 gigabyte (GB) RAM (32-bit) or 2 GB RAM (64-bit). 16 GB available hard disk space (32-bit) or 20 GB (64-bit). DirectX 9 graphics device with WDDM 1.0 or higher driver. Additional requirements to use certain features. Depending on resolution, video playback may require additional memory and advanced graphics hardware. For some Windows Media Center functionality a TV tuner and additional hardware may be required. Windows Touch and Tablet PCs require specific hardware. HomeGroup requires a network and PCs running Windows 7. DVD/CD authoring requires a compatible optical drive. BitLocker requires TPM 1.2. BitLocker To Go requires a USB flash drive. Windows XP Mode requires an additional 1 GB of RAM, an additional 15 GB of available hard disk space, and a processor capable of hardware virtualization with Intel VT or AMD-V turned on. Music and sound require audio output. Note: Product functionality and graphics may vary based on your system configuration. Some features may require advanced or additional hardware. Please ask any questions before purchasing. The item "Microsoft Windows 7 Ultimate, SKU GLC-00182, Full Retail Box, 32-bit, 64-bit" is in sale since Saturday, November 17, 2018. This item is in the category "Computers/Tablets & Networking\Software\Operating Systems". The seller is "sellerandbuyer2007" and is located in New Brunswick, New Jersey. This item can be shipped worldwide.